№25192068 Arctic fox (Vulpes lagopus) portrait, Wrangel Island, Far Eastern Russia, June. №25191995 Arctic foxes (Vulpes lagopus) juveniles playing, biting tail, Wrangel Island, Far Eastern Russia, August. №25192095 Arctic fox (Vulpes lagopus) running in summer coat, Wrangel Island, Far Eastern Russia, August. 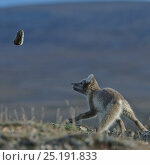 №25192303 Arctic fox (Vulpes lagopus) in winter fur, stealing Snow goose egg, Wrangel Island, Far Eastern Russia, June. №25192130 Arctic fox (Vulpes lagopus) in winter fur, chewing on root, Wrangel Island, Far Eastern Russia, October. №25196257 Arctic foxes (Vulpes lagopus) playing, silhouetted at sunset, Wrangel Island, Far Eastern Russia. August 2010. №25192084 Arctic foxes (Vulpes lagopus) playing, in summer fur, Wrangel Island, Far Eastern Russia, August. №25192565 Arctic fox (Vulpes lagopus) in summer coat with lemmings in mouth, Wrangel Island, Far Eastern Russia, August. №25192092 Arctic fox (Vulpes lagopus) running, mid moult into summer fur, Wrangel Island, Far Eastern Russia, June. №25192200 Arctic fox (Vulpes lagopus) in winter fur, licking nose, Wrangel Island, Far Eastern Russia, October. №27074148 Meerkat (Suricata suricatta) watching Cape fox (Vulpes chama) Kgalagadi Transfrontier Park, Northern Cape, South Africa, January. №25208116 Red Fox (Vulpes vulpes) running out of sea with water dripping off coat, southwest Finland, February. №25147543 Red fox (Vulpes vulpes), portrait of juvenile, South Karelia, Finland, August. №25147548 Red fox (Vulpes vulpes) sleeping, South Karelia, Finland, June. №25144588 Red fox (Vulpes vulpes) sitting at forest edge, South Karelia, Finland, June. №25144954 Red fox (Vulpes vulpes) portrait, Amsterdamse Waterleidingduinen, near Zandvoort, The Netherlands, November. №25144935 Red fox (Vulpes vulpes) investigating camera, Amsterdamse Waterleidingduinen, near Zandvoort, The Netherlands, November. №25207912 Red Fox (Vulpes vulpes) in grassland, Lapland, Finland, July. №25142451 Red fox (Vulpes vulpes) face portrait.